Three of the films starred Mollywood superstar Mohanlal in the lead role. Mumbai: Bollywood has often looked towards the South film industries for films to remake to generate some desperate moolah. 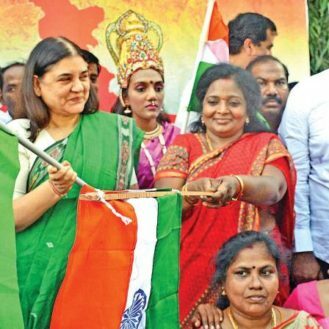 Actresses have descended down south to establish themselves and superstars like Amitabh Bachchan (Khandahar) and Anil Kapoor (Chandralekha, apart from starring in Mani Ratnam’s Kannada film Pallavi Anu Pallavi) have done some popular cameos. 2016 has been particularly generous on the south stars, with some of them delivering monstrous hits, validating their position. There were also some critical successes that came into national prominence. We have listed below the absolute game-changers of 2016. Read on! A gangster Rajinikanth sporting a badass silver beard, playing his age on-screen after over a couple of decades. The film was bound to be lapped up by his gargantuan global fan-base. The Pa. Ranjith directorial, which also starred Radhika Apte, grossed over 350 crore rupees approximately, ending up being the highest grossing South film of the year, ending a painful drought of hits for the superstar, after a string of flops that had jeopardised his career. Mohanlal had been having a very lacklustre few years post the release of his iconic ‘Drishyam,’ the horrendous streak of flops being even longer for director Priyadarshan. However, the iconic duo, who’s given many a cult comedy to Malayalees over the years, give hope and create an inherent hype, every time they announce a film together. However, when they announced that ‘Oppam’ won’t be a comedy but a suspense thriller, sceptics were on overdrive with their justified cynicism. However, the film, upon release, turned out to be better than Priyan’s most recent releases, inspite of its tackiness and plot convolutions, flanked by an inspiring act by its superstar lead as a blind man. The film turned out to be the third highest grosser of all time in Mollywood, with remakes lined up in all south languages alongside a Bollywood rehash by Priyan himself, with names like Ajay Devgn, Saif Ali Khan and John Abraham being thrown around for the lead’s part. ‘Visaranai,’ India’s official entry for the 89th Academy Awards, has been doing the festival circuit rounds since 2015, impressing all and sundry. The film, which won three national awards this year, including Best Feature Film in Tamil, also fetched a Best Actor in a Supporting Role for Samuthirakani. The very gruesome tale of a group of labourers who are brutally subjugated into confessing a crime they never committed, to be taken under the wings of a seemingly honest cop, was indigestible and unfathomably caustic for the faint-hearted. 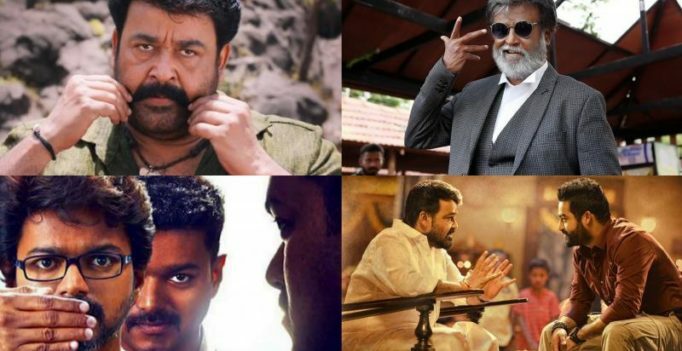 Mohanlal has had the best year of his career when it comes to box-office collections, with three major blockbusters in 2016. He marked his full-fledged entry into Tollywood with the sweet and simple ‘Manamantha,’ also starring Gauthami. However, his advent into the hearts of the potboiler-snorting average Telugu mind culminated with Koratala Siva’s ‘Janata Garage,’ where he was seen alongside youth icon Junior NTR, in the role of a kind-hearted yet merciless modern day Robinhood vigilante. The film, despite of its blatant moral policing and contrived plot-points, was a welcome critical success, understandably enough, in a land that has been unwarrantedly fed unabashed mediocrity over the years. The film also grossed over 135 crore rupees approximately, ending the year as the highest Telugu grosser. 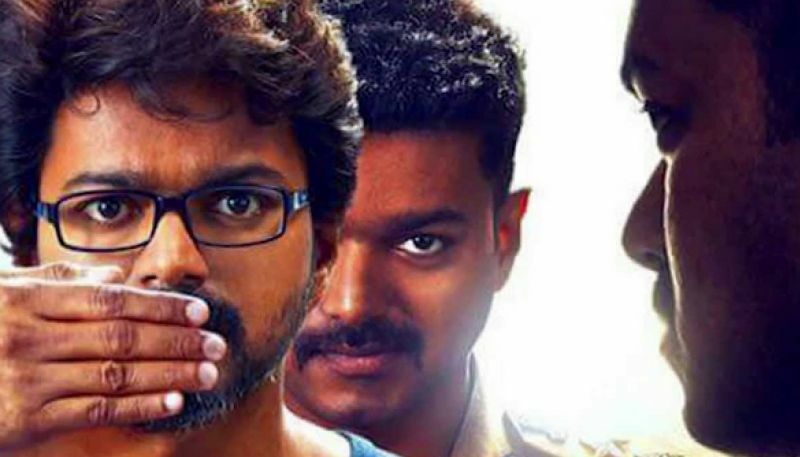 Ilayathalapathy Vijay was in desperate need of a hit, after the disastrous ‘Puli,’ which would probably have worked in a pre-Baahubali era, despite of the unendurable atrocity that it was. And in ‘Theri,’ director Atlee gave him exactly that. The film, a modern day re-interpretation of Rajinikanth’s ‘Basha,’ was the tale of an underground cop waiting to settle scores and have his rightful vendetta. The film was so huge a phenomenon in Tamil Nadu, that it ended up grossing more than Rajini’s ‘Kabali,’ in the state. It reinstated his incorrigible stardom to its former glory and gave the superstar a new lease of life. Mohanlal’s grandiose announcement as the Numero Uno of Mollywood, Pulimurugan, not only became the first Malayalam film to gross over 100 crore rupees at the box-office, but also became the first to touch 150 crores, ending up being the third highest grossing South Indian film of the year, behind ‘Kabali,’ and ‘Theri’. The superstar, who shocked everyone with his phenomenal action, playing a village hunter who kills aggressive tigers with a vengeance in the film, has established his supremacy to such an extent that the three highest grossers of Mollywood today, are his. Besides these, Pawan Kumar’s ‘U Turn,’ Rajeev Ravi’s ‘Kammattipaadam,’ Ravikanth Perupu’s ‘Kshanam,’ Raam Reddy’s ‘Thithi,’ Dileesh Pothan’s ‘Maheshinte Prathikaram,’ and Vamsi’s ‘Thozha,’ also deserve a special mention for daring to explore erstwhile unconquered cinematic domains. Reliance Jio is expected to announce the device at parent Reliance Industries’ annual general meeting on July 21. Billionaire Mukesh Ambani’s Reliance Jio Infocomm Ltd….